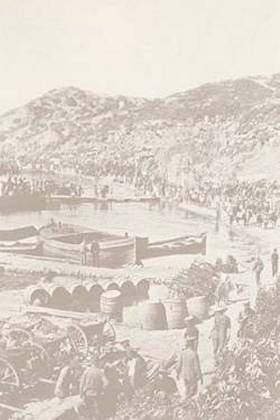 Resource-rich booklet to download for use in a major timeline-based activity on the Gallipoli Campaign. From the landings on 25 April 1915 to the evacuation on 7-19 December 1915 and 7-9 January 1916. From August 1914 to January 1916. A timeline of events, using letters and diary entries. Sample pages from a commercially available book for secondary students, Analysing Australian History by Ken Webb (Cambridge). The chapter includes a Gallipoli timeline for 1915. "Abridged version of the Gallipoli Diary from Major Fred Waite DSO, The New Zealanders at Gallipoli (1919)". The timeline can be seen as part of the full diary at Appendix VI of The New Zealanders at Gallipoli,2nd ed. 1921 (original ed. 1919) (gutenberg.org). Timeline covering wars and other general military activities.